I have been playing with the calculated PageRank for simple systems using the little web app I put together the other day. This is partly to continue improving my understanding of the PageRank algorithm, but also to root out any issues with the implementation itself. I was looking at one system and was concerned that the calculated solution was wrong. This is because the end result was (and is) counter-intuitive. 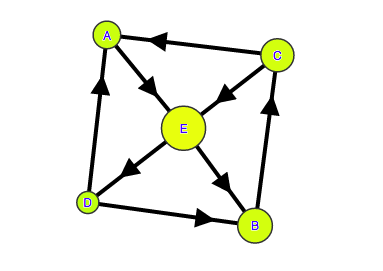 A "Simple" Network - Is It Obvious to You Why "C" should have a higher PageRank than "D"? This is all just arithmetic, written out here as part of confirming the answer once again. The bigger issue to me is how to explain the result in any kind of simple or intuitive manner. Could you have predicted that Page D would have a PageRank less than page C, especially if I told you that E was going to have a higher PageRank than B? Page D seems to get ALL of Page E's PageRank, which has the most PageRank of any of the pages. Page C gets all of B's PageRank, but Page B has less than Page E. The results are not intuitive. This being a bit overly dramatic, I realize. And I understand that PageRank (or rather, its evolved form internal to Google) is only one of many factors used in determining the rankings. Nevertheless, I still have experimentation and reading-up to do on this area in search of the "explanation for a five-year-old". Please feel free to let me know what you find as well. Perhaps something obvious is being overlooked here.